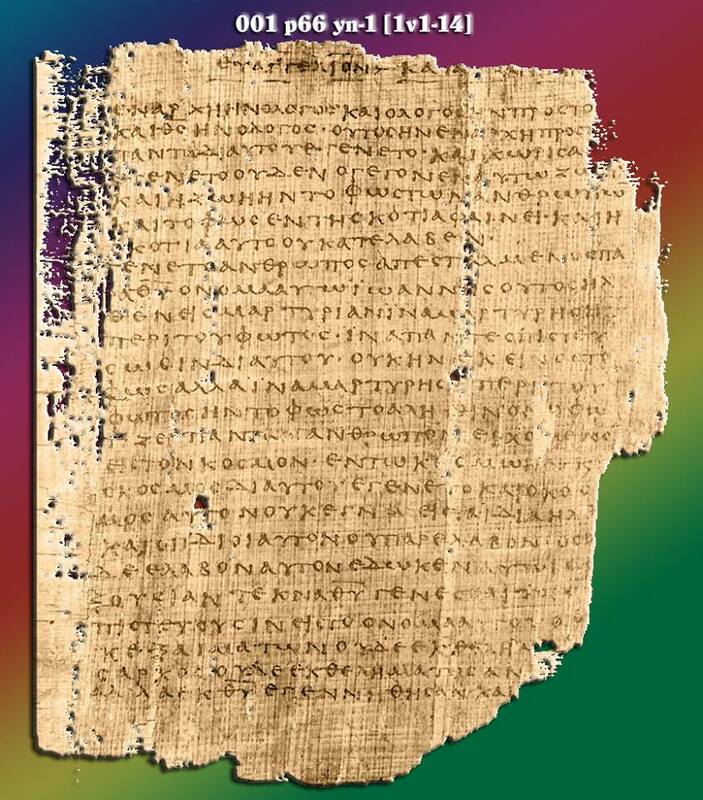 Uriel Ben Mordechai has made a number of ‘dynamic equivalence translations’ of selected NT letters and narratives based upon the earliest Greek manuscripts available e.g. Papyrus 46 [dating to between 170-200 CE] and Codex Sinaiticus [dating to about 350 CE]. These English translations, produced with a Jewish pro-Torah bias, have been published and distributed from the Eternal City just as the Prophet predicts… “…out from Tzion the Torah shall go forth, and out from Yerushalai’im, the Word of HaShem” [Yishaiyahu/Isaiah 2:3]. Uriel has now turned his attention to Papyrus 66. The manuscript contains John 1:1-6:11, 6:35b-14:26, 29-30; 15:2-26; 16:2-4, 6-7; 16:10-20:20, 22-23; 20:25-21:9, 12, 17. It is one of the oldest well preserved New Testament manuscripts known to exist. The manuscript was found in 1952 at Jabal Abu Mana near Dishna (Egypt). There is debate over when this codex was produced with some arguing for as early as the middle of the second century (~ 150 CE), though most scholars now ascribe a date in the 3rd to 4th century (201 – 399 CE). I would like to share a few details on Uriel’s translation of the first chapter of John’s Gospel (using the more appropriate terminology of “Yochanan’s narrative”). Long before Uriel began this work a number of scholars including the late Professor David Flusser had argued for a very different translation of Yochanan 1:1. I discuss this in some depth in two articles ‘The Torah Dressed Itself in Flesh’ (https://goo.gl/xMiGVm) and ‘John 1:1c – Arianism’s Fatal Flaw’ (https://goo.gl/fMmkbU). There is so much to unpack here in these 3 verses alone!Jewish Rabbi’s and scholars have long argued that it was the Torah that was with the Almighty before He created the Universe, that it was the Torah that was the blueprint for the Creation. Even Hellenistic Jewish philosophers like Philo (1st Century CE) argued for this understanding (for more on this also see my article here – https://goo.gl/CZUH2D). I would love to hear peoples thoughts on these verses. For example, note that Uriel uses ‘IT’ in verse 3 where most modern translators have made what appears to be an unjustifiable inference and used ‘him,’ and even going so far in most cases as to capitalize ‘Him.’ The 1599 Geneva Bible however appears to have been more true to the original without introducing such inferences as this translation also used ‘IT’. For those interested in observing Uriel’s progress as they translate P-66, I highly recommend consider joining him and his wife Adi, as they present their translation one verse at a time during their weekly LIVE webinar broadcasts from Jerusalem. To register for the class, use this link:http://ntcf.org/register.html. Many of us in reading our English translations of the Bible without any deep knowledge of the underlying Hebrew language and Jewish approach and idioms can so easily be led astray and totally misunderstand many passages. One example that I have dealt with at length in the past is the Augustine’s doctrine of Origin Sin and the associated doctrines of Calvin’s TULIP principles, that I believe lead to some very harmful consequences in life and especially relationships. The quote in verse 10, a quote from the Tanakh is taken out of context by most when read as to be a blanket statement that no-one is or can be righteous. There are many reasons for this error as I discuss in my book, but I wish to highlight just one for now. The Hebrew can quite often leave out a word, especially an adjective, that in English may be necessary to communicate the correct understanding, but that is simply not there in the Hebrew. Yet, all the Jewish Sages (i.e., Rabbinic scholars) will translate this as “For there is no righteous man on earth who does [only] good and does not sin.” – see for example page 9 of ‘Gates of Repentance’ by Rabbeinu Yonah of Gerona. Some English versions do get this correct, such as the NET and CJB, but for example the KJV, NKJV, NIV, ASV and ESV do not. Rather than re-addressing the issue of Romans 3:10 though, I wish to use this as an example to highlight the need for greater humility from Christian students of the Bible in approaching the text, and also perhaps a greater reverence for the underlying understanding and wisdom of Jewish scholarship, of those who have an in-depth knowledge of Hebrew and Jewish thinking. One such person is the Jewish translator, Uriel ben-Mordechai. Uriel has great experience in this area having already re-translated a number of books of the New Testament working from the earliest extant versions but approaching them with a Jewish mindset and pro-Torah pre-suppositional perspective. Thus I think his translations should be given serious attention from all who see themselves as humble, but zealous, seekers of Truth. In this post I want to touch on just 3 verses that Uriel has very recently translated from Papyrus 66 and the first chapter of Yochanan’s narrative (John’s Gospel). As I have already intimated a lot of flawed doctrines within Christendom are often birthed out of just one or two verses. One example of this is the flawed doctrine of pre-existence and the related deduction than ‘Jesus’ created the Universe. This is seen for example in John 1:10 where most translations essentially have Jesus/Yeshua ‘making’ (creating) the world (‘… the world was made by him …). 1:11 In the midst of this one special people, IT ended up being deposited, especially to this one chosen people; the same which they embraced. “1:10 IT [i.e., the light of the Torah] was present within the world, and even the world [itself] came into existence by virtue of [or using] IT, even though the world did not acknowledge IT [i.e., the light of the Torah]. 1:11 In the midst of [or Contributing to] this one special [or distinctive, or chosen] people, IT [i.e., the light of the Torah] ended up being deposited [or given], especially to this one chosen [or distinctive] people; the same [object, i.e., the light of the Torah] which they [readily] embraced [i.e., welcomed, or experienced]. Clearly there is no way this version of verses 10-12 could possibly lead to any implications of ‘pre-existence and the related deduction that ‘Jesus’ created the Universe’! Please read and prayerfully consider. I look forward to your feedback as well. If you really wish to dig much deeper and learn how Uriel goes about these translations and get a greater perspective on the Torah-centric reality of the New Testament, then you may wish to consider joining Uriel and Adi’s weekly LIVE webinar broadcasts from Jerusalem. To register for the class, use this link: http://ntcf.org/register.html. In this the 3rd post in this series I want to touch on 4 verses that Uriel has recently translated from Papyrus 66 and the first chapter of Yochanan’s narrative (John’s Gospel) chapter 1:15-18. 1:17 in view of the fact that through Moshe this precious gift — the Torah — was given, AND THEN the age of truthfulness shall come to pass by way of Yeshua, Mashiach. 1:17 in view of the fact that through Moshe this precious gift — the Torah — was given, AND THEN [the added benefit of] the age of truthfulness [or legitimacy] shall come to pass [or be realized] by way of [or as a result of] Yeshua, Mashiach. Clearly, the object being referenced here is not the same as in most translations, yet if considered without our common ‘Christian’ pre-suppositions I think it has an internal consistency and integrity. That is, if this was being read for the first time as a Jewish text written for, and to Jewish readers familiar with the G-d of Israel and His Torah, then it mostly gives a message well-known and well-understood, while at the same time adding something new as a result of the revelation of the life and resurrection of Yeshua. So, to reiterate, Yochanan has first extolled the great grace provided to Israel through the Torah. The Torah has brought true freedom (please see my article ‘Freedom and the Law’ https://goo.gl/XYGC8t for details on this aspect). It has given the people of Israel (AHM Israel), a great foundation to their history, their uniqueness and their trials and tribulations but most importantly the Torah; in defining the Way (Psalm 119); in defining how best to live; how to get the most out of your life through loving G-d and your neighbour, it has given them a past, a present and a future. Yet something was missing. Two thousand years ago AHM Israel was failing on two counts. Firstly, they were not being the ‘light to the Gentiles’ (for more on this please see my article on Isaiah 49 – https://goo.gl/d3Vy8b) they were called to be. They were not, for the most part, introducing the pagan world to the Truth of the One True G-d and away from all the idolatry that the pagan Gentile world practiced. And secondly, a large part of the reason for why this failure was occurring was the internal ‘hatred’ of Jew for Jew, or as the Rabbinic scholars have described it, the ‘baseless hatred’ that existed and was instrumental in the horror that was the fall of Jerusalem in 70 CE. So Yochanan was speaking into this reality with the ‘good news’ of the arrival of Yeshua to speak truth to AHM Israel, to call for their repentance and full return to the embracing of Torah so that they could in turn be that light to the Gentiles that was their central mission. The Resurrection acted to convince and confirm to all open and willing to listen, that Torah really was ultimate Truth, the obeying the Torah because of a faithfulness (trusting) in the Almighty and His revelation was not only the Way to walk, but the way to convict the Gentile world of this Truth as well. It seems to me that if the great majority of AHM Israel had been open to and heeded this message, then the Olam ha’Bah (The Coming Age, the Kingdom of G-d) truly could have fully dawned in the first century and the Temple could well have remained standing. Yeshua most clearly intimated such. But Yeshua’s living example and his Resurrection instead may be viewed as a failure, if time were fixed and the future stopped. However, hope still lives on, and the future still beckons. Yeshua, the suffering servant, the Messiah ben-Yosef still stands at the ready to return to our midst and, as Messiah ben-David, to usher in the Olam Ha’Bah. Please consider this translation – perhaps your path has at this very moment reached the place where your heart and mind is open to Yeshua’s call to return to; or to learn of Torah and The Way. Perhaps today is the day and now the hour for you to reconsider the doctrines of your youth and time within the walls of your church and reconsider what and where Yeshua preached. Also, if you really wish to dig much deeper and learn how Uriel goes about these translations and get a greater perspective on the Torah-centric reality of the New Testament, then you may wish to consider joining Uriel and Adi’s weekly LIVE webinar broadcasts from Jerusalem. To register for the class, use this link: http://ntcf.org/register.html.